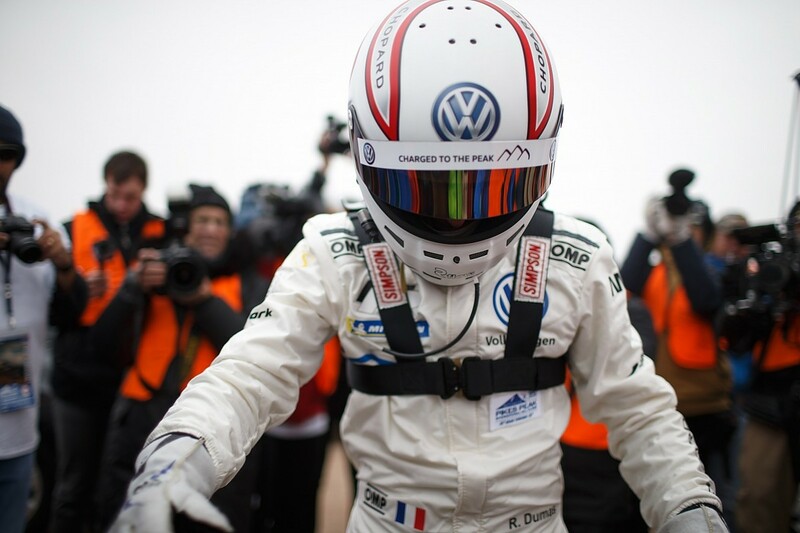 The waiting was too much, and agitation was giving way to annoyance for Volkswagen Motorsport. Out of everybody, driver Romain Dumas looked the most relaxed - strapped tightly into the svelte I.D. R electric racer, staring impassively into the distance. Every now and then he shut his eyes, mentally clipping one of the 156 apexes that lay ahead. Miss one and he might as well miss them all. Miss one and the last nine months meant nothing - he had one shot. Finally, a deeply harassed-looking official sought and found the right blue jacket. It was time. Charging umbilicals withdrawn, access hatch battened-down, tyre warmers whipped off, Dumas rolled the car away. Flicking the regulatory-required siren on to warn spectators, deer, elk and even bears of his impending arrival, he stamped on the gas and drew broken black lines through the tunnel of observers. 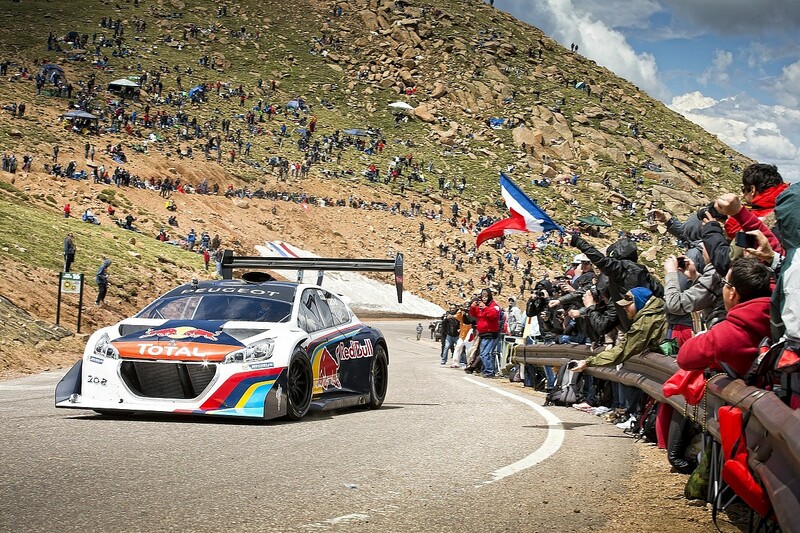 Volkwagen's Pikes Peak moment had arrived. The journey to the Peak had started in Hannover back on September 2 2017. Sven Smeets, VW's motorsport director, received a text message direct from a company board meeting that contained just a few words: 'it's a go for Pikes Peak'. Smeets called his technical director Francois-Xavier Demaison to tell him their dream had come true. They were going to go to Colorado to take a car up the famous 12.42 miles of mountain road - racing to the clouds. "When we walked out of the World Rally Championship at the end of 2016, we got a clear mission," Smeets said at the time. "One was customer racing, the other was electric. It had to be electric." Pikes Peak fitted that directive perfectly. Rhys Millen's electric record of 8m57.118s represented some relatively low-hanging fruit for a team of Volkswagen's world-class ability. Sebastien Loeb's outstanding overall record of 8m13.878s - set in a 3.2-litre twin-turbo, spaceframe Peugeot boasting one brake horsepower for each of the 850kg it weighed - was top of the tree. Smeets wasn't about to be tempted by that particular apple. "Loeb's time is in another world," Smeets said, using a tone that confirmed that part of the conversation was done. Beyond boyhood dreams fired by footage of Ari Vatanen drifting a Peugeot 405 T16 inches from oblivion, America's second oldest motorsport event (the inaugural Indianapolis 500 ran five years ahead of Pikes Peak in 1911) offered a free hand for VW. The unlimited class is just that - providing you have a roll cage and a wheel at each corner, you're good to go. Demaison smiles at the recollection of that call from Smeets. "Asking an engineer if he would like to make a car with no regulations is like asking a blind man if he would like to see - I wanted it," he says. "The only restriction with this class is your budget and your time." Since the Pikes Peak programme forms part of VW's 'dieselgate' redemption, the budget to showcase its green credentials wouldn't be an issue. But time was a problem. "This was our biggest limiting factor," says Demaison. "Our first thought was to just 'electrify' the Norma [sports-prototype] chassis Romain drove last year [at Pikes Peak]; just the tooling to make our own chassis would have taken two months. We didn't have time." The other limitation for the I.D. R was more obvious - finding a battery big enough to haul close to 1000kg of car up a hill at lightning speed. While road cars look for high energy density from their batteries, the I.D. R just needed power. It didn't need range, it needed to be a rocket with just enough juice to get across the line at 14,115ft. "Even in the days before the start of the race, we were still learning about the architecture of the batteries and how to cool them," says Demaison. "We had to have them in an operating temperature between 35 and 70 degrees to get the best performance. People ask why we only went with two 250Kw motors on each axle providing four-wheel drive? We could have taken bigger motors, that was no problem. But that meant bigger batteries, more weight." Given that Demaison grumbled about having to sew a Pikes Peak International Hillclimb badge on to Dumas' super-lightweight racesuit, rather than having it transferred on, weight was clearly at the forefront of his thoughts for nine months. But aerodynamics weren't far behind. 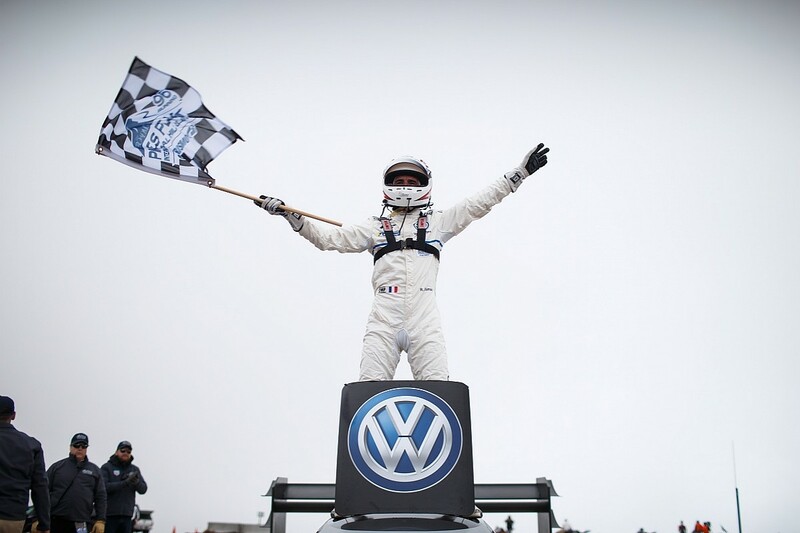 To help solve that conundrum, he turned to VW's most Formula 1-experienced engineer. "I called Willy [Rampf, formerly of Sauber F1] immediately," says Demaison. "He came straight to Hannover. "I can make a rally car, but this was something different - this was a prototype. We benefitted a hell of a lot from having Willy with us - you can't buy experience." The aero really was something on the I.D. R, headlined by a 2.4-metre rear wing. The thinking behind it was simple. "When you are up the mountain the air is 35% less dense," says Rampf. "This means you have 35% less downforce. We had to make it big to make it work. This is the most aero I have ever worked on with a race car. It was incredible." Thin air hurt the aero, but scored big for the battery. By the time Loeb crossed the line in 2013, he'd lost more than 300 of his 850 horses. When Dumas passed the flag man up top last Sunday, he still had the 680 he'd gone green with 7m57.148s earlier. That's right. Seven minutes - a first ever sub-eight-minute run. What's more, he did it through fog and a damp road through the middle sector. And he did it on his first and only flat-chat, bottom-to-top run up the entire course. Weather and niggling technical issues had spoiled VW's private, two-day test on the course late last month, and practice and qualifying is split into three separate sectors. One shot, nailed in the most emphatic fashion. And, according to Dumas and Demaison, there's more to come from both man and machine. 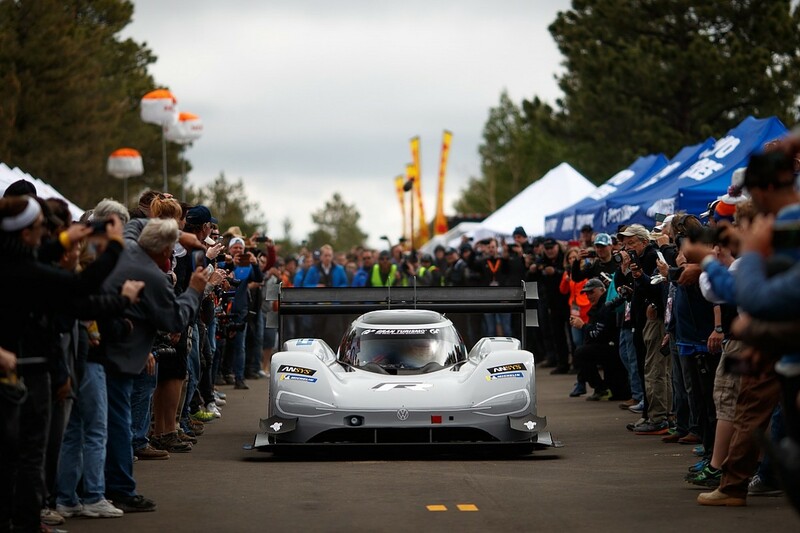 But this wasn't just about Dumas' fourth Pikes Peak win after 2014, '16 and last year with the Norma sports-prototype. It wasn't even just the latest page in VW's world-beating motorsport story. There was more to this. Speaking in the pits after the Sunday morning service at the 'Chapel in the Pines' was former race director Phil Layton. 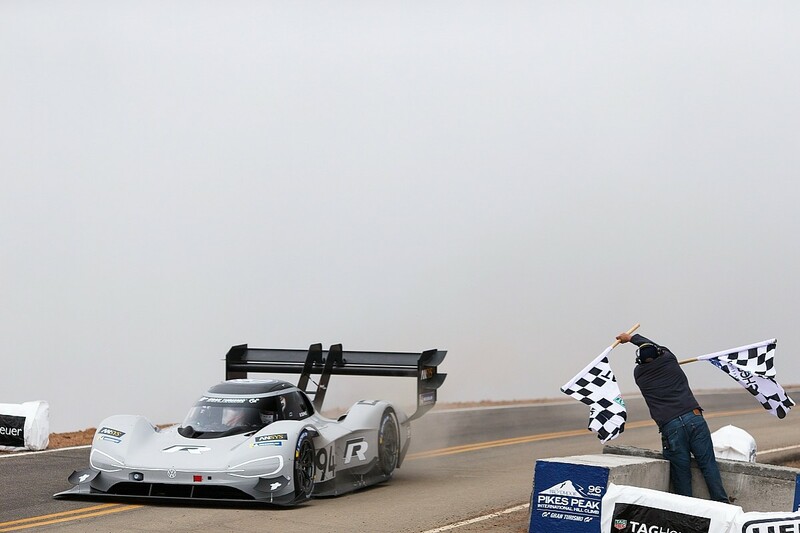 The silver-haired Pikes Peak disciple waved a hand in the direction of VW's multi-million pound effort and smiled knowingly. "They have done everything they can for the record," he says. "Everything. But they don't decide if they win or not. She does. It's all about what she gives you on the day; she's the mountain. Will Volkswagen break this record? It's up to her. Today, the mountain decides." She took her time making up her mind. With a storm expected later on Sunday (it arrived after lunch, forcing the organisers to shorten the course while allowing those who'd finished to enjoy a late June snowball fight at the summit), cloud blew in and out, and the threat of rain was ever-present. Even Dumas had begun to doubt. What would rain mean? He grimaces, "Put on the wipers and cry." But there were no tears on Sunday. The mountain did keep Smeets in suspense, as a loss of mobile WiFi connections occurred - reckoned to be one of the nuances of the electro-magnetic madness that comes at altitude when a storm's bouncing in. The result was no live stream, and once the car left the line, there was no data at all. "We had no sector times - it was like we'd come to the last stage of the season to decide the championship and we had no splits," says Smeets. "I was staring at Romain's time at the bottom of the screen - because he was the latest car to go - and suddenly he disappeared. Just when I was thinking something was wrong I noticed F-X [Demaison] starting to jump next to me - Romain had gone to the top of the screen because he was fastest." A radio crackled into life: "Time for Dumas... Seven..." And the party started. "Today, we were lucky," says Smeets. "The mountain was in our favour and said, 'OK, you can go to the top'. We did that." VW went to the very top. What Smeets' men achieved in the Rockies last Sunday was from another world. Seeing the I.D. R in full flight rearranged the senses. The silver bullet was a rocket and Dumas a ground-breaking, history-rewriting modern-day Neil Armstrong. Whatever next for Volkswagen - the moon in nine months?